Pittsburgh, PA, October 25, 2017 --(PR.com)-- Qm2® Solutions and Pittsburgh-based GenOne Media Group partner to improve patient engagement in over one thousand healthcare venues nationwide. 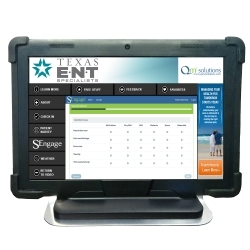 Qm2®’s proprietary SaaS platform, SEngage®, united with GenOne Media’s out-of-home-network, Smarter Lifestyle Network (SLN), provides patients with the opportunity to submit valuable feedback at the point of care. Qm2® Solutions and Pittsburgh-based GenOne Media Group partner to improve patient engagement in over one thousand healthcare venues nationwide. Click here to view the list of recent Press Releases from GenOne Media Group, Inc.